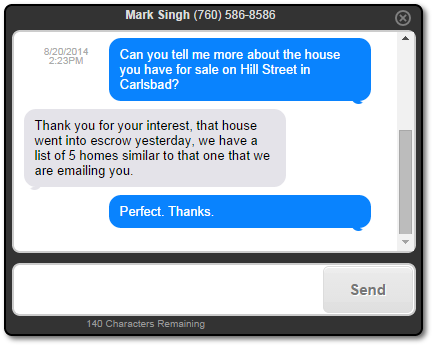 Text-to-Join is a great way to load up your database with hot prospects. People will join your email lists VIA their mobile device. We also make it easy for anyone to text-to-join. No confusing numbers or short codes to alienate your new customers. Just tell them this: "Text your email address to (775) 555-1212"
Send and receive your client's texts right from their contact record. A great way to communicate important and timely information. The good ol' telephone is still a reliable way to attract new clients. Advertise your product or service and invite your prospective customers to call a Free Recorded Message. The magic of a Free Recorded Message is that prospects feel comfortable and non-threatened calling a recorded message line where they might not call if they knew there was a chance they had to speak with a pesky sales person!